Some 7,000 people were rescued in the Channel of Sicily between Saturday 6 June and Monday 8 June. Many Italian vessels took part in the rescue operation, as well as ships sent by Germany, Sweden, Spain, Ireland and the United Kingdom. The ships brought migrants to the ports of Lampedusa, Catania, Augusta, Palermo, Trapani, Pozzallo (Sicily), Reggio Calabria, Corigliano Calabro, Vibo Valentia (Calabria) and Taranto (Apulia) on the Italian mainland. No fatalities were reported. The rescue operations carried out by the international flotilla is a prelude to what is expected to be a surge of migrant crossings in the months ahead, as calm weather in the Mediterranean encourages smugglers to fill unseaworthy open boats with vulnerable people aboard, among them refugees and economic migrants. According to IOM estimates, thus far this year through Monday, 8 June, Italian Coast Guard, Italian Navy and Italian Guardia di Finanza rescued over 28,500 migrants, while other European Union and commercial vessels have rescued just over 10,000 migrants, of whom nearly 3,500 were rescued under the European Union’s Frontex/Triton maritime patrol operation. An additional 14,500 people were rescued by commercial vessels, for a total of 53,000 rescued migrants brought to Italy so far this year. 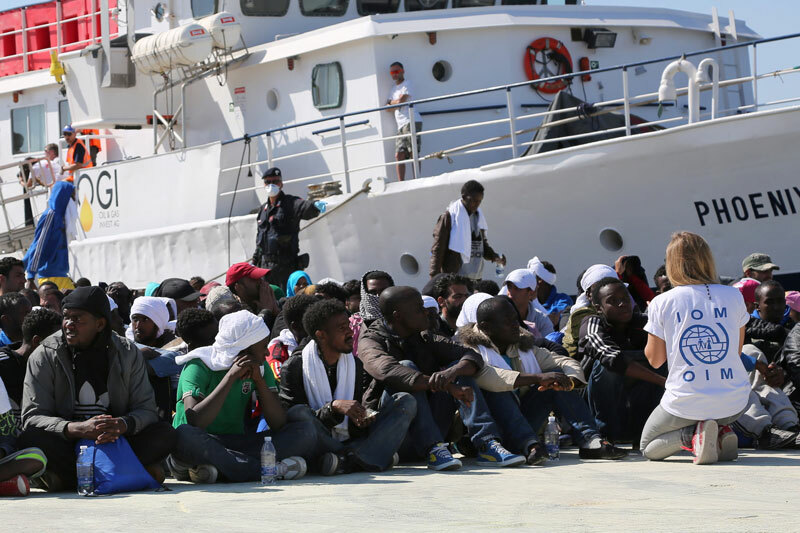 According to official figures 47,449 migrants arrived by sea in Italy from January to May 2015, a slight increase in comparison to the same period of last year, when arrivals were 41,243. As of 31 May the main nationalities of migrants arriving in Italy were: Eritrean (10,985), Somali (4,958), Nigerian (4,630), Syrian (3,185), Gambian (2,941), and Senegalese (2,328). More significantly, Greece has seen a significant increase in the number of arrivals in comparison to last year. Between January and December 2014 arrivals were about 34,000, while today, after the first five months of the year, arrivals are already about 46,150. The main nationalities of the migrants are Syrian and Afghan.